Stefan Andrew Karsay (born March 24, 1972) is a former right-handed Major League Baseball pitcher who is currently the bullpen coach for the Milwaukee Brewers. 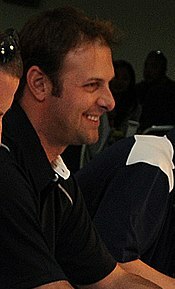 Karsay played for the Oakland Athletics (1993–94, 1997, 2006), Cleveland Indians (1998–2001), Atlanta Braves (2001), New York Yankees (2002, 2004–05), and Texas Rangers (2005). Karsay grew up in the College Point neighborhood in Queens, New York City, just a few miles from Shea Stadium. In high school, he won the Gatorade Baseball Player of the year for New York State, as a pitcher for Christ the King High School. A 1st round draft pick of the Toronto Blue Jays in 1990, Karsay was traded to the Athletics along with outfielder José Herrera for Rickey Henderson on July 31, 1993. A starter in his early days with the Athletics, Karsay worked mostly in middle relief and as a set-up man from 1998 on, although he also had some notable success as a closer in 2000 with the Indians and 2002 with the Yankees. His career was marred by injuries, causing him to miss the 1995 (elbow surgery), 1996 (Tommy John surgery) and 2003 (shoulder surgery) seasons; in all, he was on the disabled list seven times. On July 28, 2005, together with Scott Feldman and A. J. Murray, he threw a perfect game against the Corpus Christi Hooks. It was the first combined nine-inning perfect game in Texas League history, and the third overall. Finally, at age 34, Karsay announced his retirement on June 18, 2006, the day after pitching two scoreless innings against the Los Angeles Dodgers and getting the win in a 17-inning marathon for the Athletics. He finished his 11-year Major League career with a 32-39 record, 41 saves, and a 4.01 ERA in 357 career appearances, including 40 starts. In 2012 the Cleveland Indians hired Karsay as pitching coach for the rookie-level AZL Indians. In 2016, Karsay was promoted to be the pitching coach for the Cleveland Indians Class-AAA affiliate, the Columbus Clippers. Karsay was hired by the Milwaukee Brewers as their bullpen coach on November 19, 2018. ^ "Closing suits Karsay", The Atlanta Journal-Constitution, June 25, 2001, "Karsay, 29, grew up in College Point, NY, five miles from Shea Stadium." ^ "Steve Karsay, Scott Erickson hired as minor league pitching coaches by Cleveland Indians". 2011-02-02. ^ Hoynes, Paul (November 20, 2018). "Class AAA pitching coach Steve Karsay leaves Cleveland Indians to become Milwaukee Brewers' bullpen coach". Cleveland.com.